I've seen this charming vintage Brooks brooch done in two ways...with and without the clear rhinestone "candles". I really think I like this one better! It gives the colors of the rhinestones a chance to show off! 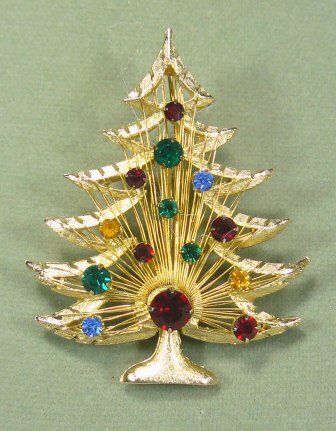 The pin is done in brushed goldtone metall with the signature wire design (I've heard this wire treatment referred to as the "harp") and is decorated with different sizes of red,gold, green, and blue rhinestones. Pin shaft is in good shape and the pin is in excellent vintage condition. It measures 2-1/4" x 1-3/4"...the perfect size to put holiday spirit on a jacket lapel, a blouse, or whatever you wish. It's bound to become a signature piece! *Vintage Emmons Necklace/Pendant: Goldtoned Wire-wrapped Star Shining Brightly! Perky Green Enameled Frog Brooch w/2 Surprises! He's by Kenneth J. Lane and is a Watch!